BOCA RATON — Home for the first time in three weeks, FAU wasn’t in the mood to let any lightning surges ground them. There’s a reason why Owls find it difficult to fly in the rain, however. After suffering the worst loss in program history in last week’s 63-7 slaughter by Kansas State, the Owls had to fight through numerous lightning delays and more injuries to key players only to limp away with a heartbreaking 31-27 loss to Ball State that dropped FAU to 1-3 for the season. Lightning was more than just background light on a dark night for the Owls, the initial kickoff was delayed nearly an hour. A second lightning delay occurred midway through the third quarter, a third came an hour later and with 5:33 left on the game clock. After the final lightning delay, Ball State quarterback Riley Neal led the Cardinals down the field and scored with 1:46 left on a two-yard run, giving Ball St. it’s margin of victory. Starting from their own 30 following a 4th-and-short run by Buddy Howell that went nowhere, Neal went 3-4 for 35 yards on a drive that showcased the poor tackling that continues to plague FAU’s defense. A week after being replaced by backup Daniel Parr, quarterback Jason Driskel responded by leading the team to two scoring drives in the first quarter – one of which ended with him running into the end zone for his second rushing touchdown of the season. The other score saw Driskel connect with Kalib Woods for a 31 yard strike, the latest highlight between the two. A year after only catching 27 balls for 350 yards, Woods has elevated his game to a new level with 24 catches and 347 yards. Woods finished the loss with 4 catches for 108 yards. The composure and playmaking skills that led Partridge and offensive coordinator Travis Trickett to pick Driskel over Parr in fall camp returned early on Saturday night in full force. With his seat as the team’s starter warming up after two blowout losses, Driskel silenced the doubters with an electric performance where he totaled 324 yards passing and played mistake-free for 58 minutes. It was his interception to seal the loss, however, that is going to be the moment most remembered from this game. For the first time this season, Buddy Howell was held scoreless and was limited to just 3.7 yards per touch on eighteen carries. Not getting the explosive plays Howell is prone to making definitely had an impact on FAU’s offense, especially on the fourth and short midway through the fourth quarter. Not all was negative on the rushing front, however, as Kerrith Whyte scored his first collegiate touchdown in the second quarter on a three-yard rush. In the past two weeks, Whyte has averaged 4.8 yards a carry and given the Owls a nice compliment to Howell. The injury bug bit the Owls yet again as both offensive lineman Tarrick Thomas and cornerback Ocie Rose each had to leave the game. Thomas was on crutches for the second half of the game. Leading 27-24 with 7:48 remaining, FAU twice the gave the ball to Buddy Howell, who gained 24 yards on two tough runs. Ball St. held the Owls to two yards on the next two plays, and on fourth-and-1 from the Cardinals’ 32 stuffed Howell on a run up the middle. Ball St. got the ball back and, after a weather delay, launched what turned out the be the game-winning drive. FAU’s patchwork offensive line enjoyed its best night of the season. Matt Weiner started at right tackle, with Antonyo Woods moving to the left tackle. FAU put together two good drives in the first quarter, but did lose left guard Tarrick Thomas to injury. As well as the line played, though, FAU failed to score on a goal-to-go situation in the second quarter, leading to a field goal from the 1, and they couldn’t open a hole on that crucial fourth down play in the fourth quarter that gave the ball back to Ball St. The health and effectiveness of the offensive line will determine whether the Owls can climb back into bowl contention. With the victory over Old Dominion that concluded last season season, the Owls thought they had finally solved the late-game issues that had cost them games. That doesn’t appear to be the case. There weren’t any strange late-game decisions or outright blown plays – though the Owls did look inept in the two-minute drill. The fact is, this team simply doesn’t know how to win games that are close, late. Maybe it’s something in the Boca Raton air, but Florida Atlantic really looked at home in the first half; Jason Driskel looked composed for the first time since the season opener, all of the receivers – not just Kalib Woods, as has been the case in recent weeks – were making plays, and the defense finally showed some life after consecutive blowout losses. If Saturday’s first half is a sign of things to come for how the Owls are going to play in the first thirty minutes of games, then more wins are in the Owls’ future. Buddy Howell isn’t going to get held up often, but averaging just 3.7 yards per carry on Saturday limited FAU’s offense, especially in the second half. When Howell goes, the offense goes and the team goes but when Howell doesn’t go and he’s held to games below the level of his talent, it’s hard to get things going if you’re the Owls. 2 – Penalties by the Owls, a staggeringly-low count for a team who’s battled off-sides and holding problems all year. 3 – Different players who recorded 10 tackles for the Owls: Jalen Young, Nate Ozdemir and Azeez Al-Shaair. 8 – Consecutive Conference-USA games the Owls will play to end the season. The Owls will leave Florida for just three of those games, however. 10 – Losses in 12 Non-Conference games since Partridge took over prior to the 2014 season. 11 – Different Owls who caught passes on Saturday. The Owls’ offense finally started spreading the ball. 23 – Catches junior Kalib Woods has on the season through four games. Woods only had 27 catches all of last season. 74 – Yards rushing for Ball St. QB Riley Neal, who baffled the Owls on the read option. He also threw for 252 yards. 226 – Yards rushing for Ball St., which made the most of the Owls’ talking issues. 448 – Yards of total offense for Ball St.
For the fourth time in five weekends, the Owls will stay in their native state of Florida as they travel to Miami for this year’s edition of the Shula Bowl and a match-up with the FIU Panthers. Kickoff is scheduled for 7 p.m.
FAU led Ball St. much of the evening but a Riley Neal touchdown with 1:47 remaining in the game propelled the Cardinals to a 31-27 victory. Afterward, FAU coach Charlie Partridge addressed the media, discussing the effect of the game’ three lightning delays, the mindset of the team and the play of a defense that allowed at least 30 points for the fourth time in four games. The loss dropped FAU to 1-3 on the season and concluded the Owls’ non-conference schedule. FAU travels south to face FIU on Saturday in the Shula Bowl. Kickoff is scheduled for 7 p.m.
Players are out on field! FAU is decked out in their all-red. Ball State rocking an early 2000’s Arizona Cardinals like white on red. Player to watch today for FAU: Ocie Rose. Rose had been bothered by a lingering ankle injury and says he’s all caught up now. Here we go again with the lightning. Major strike in front of FAU press box. And there’s another! And another! Both teams are coming off field and we are in our second lightning delay. Looks like FAU student section is moving out as well. If we have another 30 min delay, we could be looking at 7-7:10 start time. It’ll be very interesting to see how both teams respond. It’s early. Just two minutes in but Driskel seems calmer, more composed. Maybe two straight losses and being subbed out hit him hard? Tarrick Thomas is down for Owls and is being looked at. He will walk off under own power with trainers but this hurts FAU big time to start. There’s that FAU defense again. Third down and they let up a first down pass play despite pressure on QB. More of the same for the Owls. The Mask of Soroh strikes again. Another turnover forced by the redshirt sophomore — his second pick of the year — and FAU has ball. So, Jason Driskel and Kalib Woods are like Montana-Young or Manning-Harrison. Major pass play from QB to WR has FAU in Ball State RZ. Jason ‘Cam’ Driskel rushes it in for a score. 7-0 FAU with 7:26 left. The offense and defense each did what they had to. That type of night. 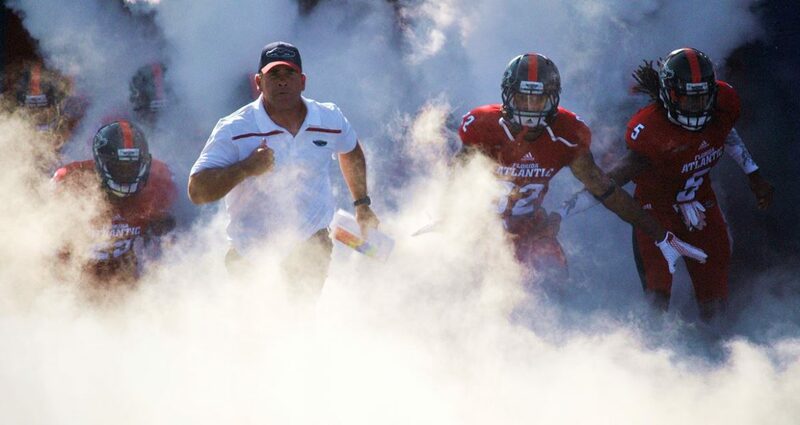 At this point, FAU is going to learn how to wrap up and tackle when Florida stops being hot. Ball State now on FAU’s 37 and driving. FAU is playing solid offense. FAU is playing solid defense. But FAU lets up a sack which is to be expected with o line. FAU is 2-2 on fourth down conversions. We’re in the first quarter. Nearly everything is going right for the Owls so far..
DRISKEL’S GOT WOODS. The Owls’ second score of the quarter and they’re up 14-0 after another Woods catch! FAU looks reborn tonight. Riley Neal takes Ball State down the field to make it a 14-7 game. Let’s hope those nice FAU defensive stands wasn’t a one-quarter thing. Good news: FAU gets a first down on a throw to Harrison Bryant! Bad news: The ball is fumbled! Worse news: Ball State Recovers. 14-14 game. Ball State has scored twice in five minutes. So John made it Raine and Nate Terry just hauled in a massive 47 yard gain. Then…KERRITH WHYTE? The running back puts FAU up with a score! 21-17 FAU after Ball State kicks a field goal. 5:42 left in the first half here in Boca. Would I consider going for it on fourth and goal on the one? Maybe, but FAU playing it safe and going up seven works. 24-17 good guys. Ball State is at FAU’s 25 with 19 seconds left in the first half. Knowing law of averages, FAU either forces turnover or lets up score. FG no good!! We’re at half and FAU is up by a 24-17 score. Let us know your thoughts on the game. Who’s your player of the game so far? Driskel goes down and the lightning is back in the skies above FAU. That’s either a sign of things to come or @JakeElman jinxing us again. Owls back on offense. Driskel driving down field. Seems like the Trickett offense is finally working wonders for FAU. Wake up. We’re tied. Ball State scores on a Corey Lacanaria touchdown and we’re knotted up at 24. FAU getting ball back with 1:46 left. Kalib Woods is human. The red hot wideout fumbles after a nice catch and Ball State has the ball on their 48 yard line. It’s Trey time.. PLAY REVERSED. FAU has the ball at Ball State’s 28 (mistype earlier when I said 48) and now the Owls will try to reclaim the lead. FAU on to kick a FG. Greg Joseph enters this kick perfect on the year…and he makes it. 27-24 Owls with 9:18 left tonight. Four. Four lightning delays. This one with 5:33 left in the game. Where’s the count when you need him?? Couple things to note. Number one: C-USA rules dictate a game CANNOT resume after midnight. If game is not resumed, game ends 27-24 FAU. Even though this is non-conference game, NCAA rules dictate N-C game rules are followed by home team’s conference rules. C-USA here. *wakes up from slumber* we’re back in Boca. 5:33 on the clock, FAU needs to hold this lead to enter conference play 2-2. First and goal for Ball State with under 3 min left. FAU needs a stop. Not losing but put your rally caps on. The Owls have been grounded..for now. 31-27 Cardinals with 1:47 left on the clock. We need a #DriskelMiracle hashtag that out folks! 4th and 15 and we need a #DriskelMiracle. Stadium is nearly empty…and intercepted. What a heartbreaker in Boca..
FAU loses their third straight. That’s all from Boca. Night folks. FAU vs. Ball St. LIVE! Key for the Owls: Get into an early offensive flow. FAU needs something to go right in order to get some confidence back. While a long Jason Driskel-to-Pico Harrison hook-up or an explosive run by Buddy Howell, Kerrith Whyte or Devin Singletary would be useful, what the Owls really need is a methodical 10-play drive. If FAU wins the toss, take the ball and go. Key for the Cardinals: Contain Buddy Howell. Most of Howell’s numbers aren’t outstanding. He’s averaging 4.9 yards per carry, but remove his three long TD runs and that average dips closer to 2.0 He hasn’t surpassed the 100-yard mark since Week 1. Howell does have those four touchdowns, though. Three of them have come on runs longer than 35 yards. If Ball St. doesn’t let Howell get rolling, FAU has yet to show it can be effective through the air. 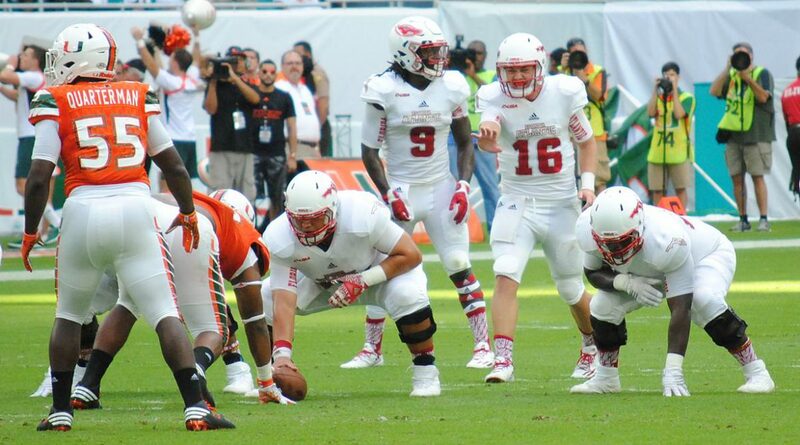 Key Match-up: Ball St. offensive line vs. FAU defensive line. 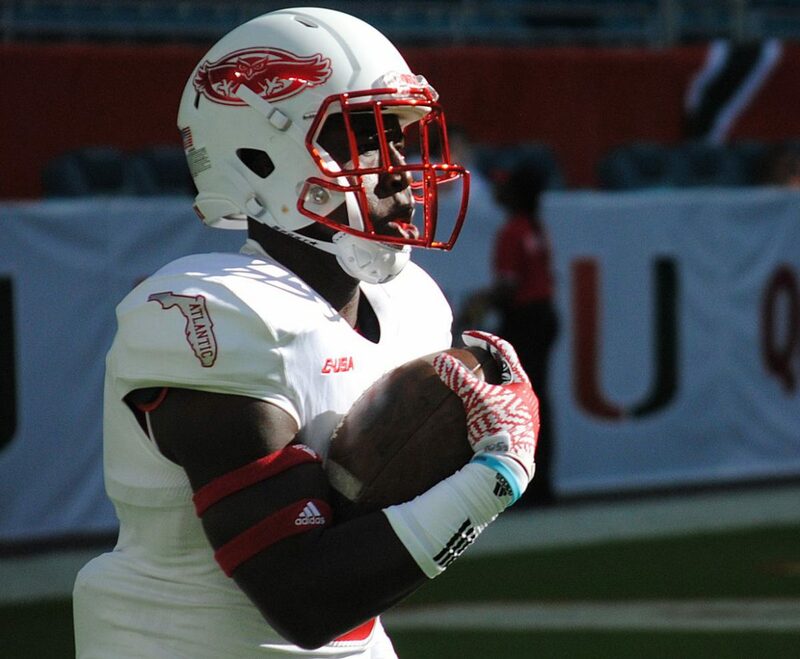 FAU lost Trevon Coley and Brandin Bryant from last season’s team to graduation. The Owls lost another defensive tackle, Ray Ellis, for the season to a knee injury early in fall camp. Current defensive tackles Stephen Leggett, Shalom Ogbonda, Kevin McCrary, Will Davis, Josh Kendell and Denzel Whitfield have combined for 16 tackles on the season. Ball St. is averaging 219.3 yards per game, which is actually less than the 307.5 average the Owls allowed over their last two games. If the Cardinals can run the ball, this will be a long day for the Owls. Player to Watch: On Thursday Matt Wilson wrote about Kerrith Whyte’s intent to find the end zone against Ball St. A good afternoon from Whyte, whether it’s out of the backfield or on special teams, should bode well for the Owls. Remember, Whyte can also be a dangerous weapon in the passing game. Linebacker Rotation: An injury suffered against Miami kept Khantrell Burden out of the Kansas St. game. He is expected to return to the starting lineup on Saturday, but he may not last long there. True freshman Rashad Smith recorded five tackles against Kansas St. and is impressing with his progress. Smith is definitely pushing Burden and could take over Burden’s starting spot. Double Vision: FAU is needlessly setting itself up for a special teams penalty with all the duplicate numbers currently on its roster. The NCAA permits two players to have the same number (usually one on offense and one on defense), but two players wearing the same number can’t be on the field at the same time without drawing a penalty. Generally, when that happens it’s on special teams. Henry Bussey and Ocie Rose share No. 1. Tyler Cameron and Shelton Lewis share No. 3. Devin Singletary and D.J. Juste share No. 5. Each of the first 10 numbers has a doppleganer. Whitfield can’t be on the field (without temporarily donning a different jersey) if Greg Joseph is kicking off or kicking field goals. If kicker Landon Scheer ever gets in a game, Kamrin Solomon has to be on the sidelines. It’s a silly risk to take, really. 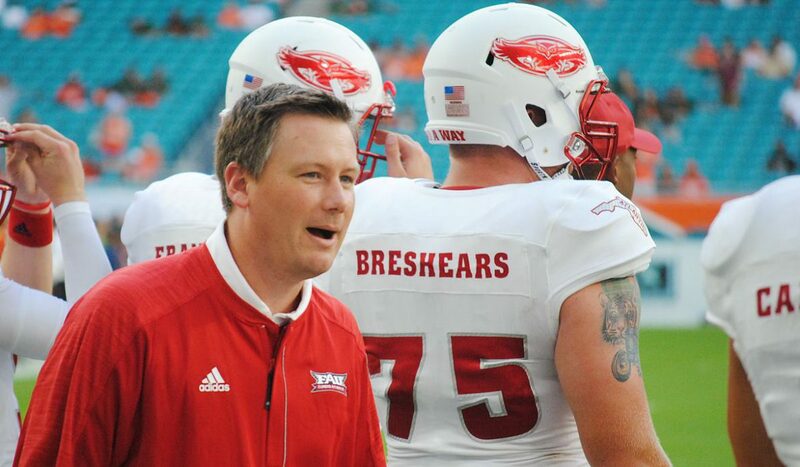 Drawn and Quartered: FAU has played 12 quarters of football entering Saturday’s game. The Owls held the lead after only two of them – the third and fourth quarters of the victory over Southern Illinois. The third quarter of that game is the only quarter all year that the Owls have outscored their opponent. It’s difficult to win games without winning a few quarters along the way. BOCA RATON – It the midst of yet another tumultuous start to the FAU season, offensive line coach Garin Justice values a calming influence. He knows the players on his unit have to be the ones who provide serenity – not only for him but for the entire team. Maybe someday Jason Driskel will become Brady-esque, but the redshirt sophomore certainly isn’t there yet. He’s been harassed much of the season – only four FBS teams have allowed more than the 13 sacks the Owls have surrendered. Lack of consistency in the running game only adds to the pressure on Driskel. FAU’s 18.3 points per game average ranks 114th out of the 128 FBS schools and nearly all of the issues trace back to the offensive line. To be fair, this is not the offensive line makeup the Owls planned for. Of the five players who worked as starters throughout fall camp, only Dillon DeBoer played in all three games thus far – and he did so at two different positions. DeBoer moved from center to left tackle one week before the start of the season when a motor scooter accident ended Reggie Bain’s season. 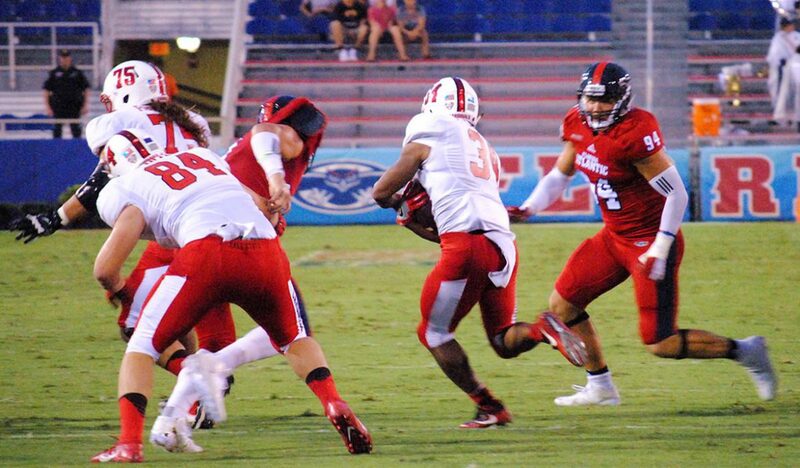 FAU lost its other tackle, senior Kelly Parfitt, early in the season’s second game. Right guard Antonyo Woods missed the first game with an undisclosed injury, then moved to tackle when Parfitt went down. Roman Fernandez moved from guard to center when DeBoer moved to tackle in place of Bain, but Fernandez suffered an undisclosed injury against Miami and didn’t play against Kansas St. The Owls are trying to get back to normal. DeBoer returned to center last week and spent this week working out there, too. “I definitely feel more comfortable at center, now,” DeBoer said. Redshirt freshman Bryan Beck, true freshman Brandon Walton and walk-on redshirt sophomore Matt Weiner rotated – and struggled – at left tackle against Kansas St.
As the week progressed FAU coaches seemed less optimistic about getting Parfitt back for Saturday, but Justice said Weiner, who started as a fill-in for Woods in the Week 1 game before suffering his own injury that forced him to miss the Miami game, should see more playing time this week – possibly at Parfitt’s tackle spot or at right guard in place of Jakobi Smith – now that Weiner’s shoulder is nearly 100 percent healthy. “Everybody rotating gets a little messy sometimes,” said DeBoer, a redshirt senior. For the second-consecutive Saturday the Owls could feature a left side of the line comprised of redshirt freshman Tarrick Thomas at guard and either Beck, a redshirt freshman, or the true freshman Walton at left tackle. Thomas, and Walton for that matter, may be the future pillars of the Owls’ offensive line, but for now they are apprentices, learning on the job. “It’s still pretty quick but it’s slowing down,” said Thomas, who is the only member of the offensive line to start all three games at the same position on the offensive line. Facing a Ball St. team that fires a variety of blitzes at its opponents, Saturday’s game doesn’t figure to get much slower. Varying defensive looks is particularly effective tactic against young offensive linemen. Sending a young, inexperienced, offensive line to decipher and ultimately block a variety of blitzes isn’t usually the recipe for Zen-like tranquility. More shuffling this week will likely lead to further struggles against the Cardinals. The season is still relatively early – Conference USA play doesn’t begin until next week – but Justice’s quest for calm carries an uneasy sense of urgency. Following the worst loss in program history last week at Kansas St., the re-institution of calm on offense would be the most important step toward the Owls’ second victory of the season, allowing them to enter Conference USA play at 2-2 with a clear path toward bowl eligibility. BOCA RATON – Kerrith Whyte will take the field on Saturday against Ball St. with a single-minded focus. Whyte is emerging as a bright spot for FAU. A redshirt freshman, Whyte has shown improvement in each of his first three games. Last week at Kansas State, he was FAU’s leading rusher with 54 yards on nine carries. That came after totaling only 23 rushing yards in his first two games. Whyte attributes the improvement to having the patience to let holes develop. “I’m starting to know the offense in and out, starting to know where to go,” Whyte said. Three games into the season Whyte is the Owls’ second-leading rusher with 77 yards on 25 carries. He’s yet to score that first collegiate touchdown, but has a vision of how he wants to see it happen against Ball St.
“A long run, explosive – like, whoa, that-guy’s-fast type of run,” Whyte said. That type of play could easily come on a kick return. Whyte tallied 87 yards on four kickoff returns against Kansas St. The week before, against Miami, he averaged over 29.8 yards per return and nearly broke a couple for touchdowns, including his season-long of 38 yards. Though young, Whyte is well aware that FAU has yet to have a kickoff return for a touchdown in program history – with Anthony Jackson’s 85-yard burst against Marist in the Owls’ first year being the longest. Whyte ranks 23rd nationally, averaging 26.1 yards per return. He’s having success despite having never returned kicks before at any level. Returns yards might not come so easily against Ball St. The Cardinals are only allowing opponents 20.1 yards per return and have not permitted a touchdown return. But that’s not getting the end zone off Whyte’s mind. “I am trying to be the first (FAU player) to get a kick return for a touchdown,” Whyte said. Coming off the worst loss in program history, FAU players and coaches are looking to put that dreadful loss to Kansas St. behind them by defeating Ball St. In this week’s OwlTalk, ESPN West Palm’s Brian Rowitz and our Chuck King take a brief look back at the K-State game before examining what the Owls have to do to get back to .500. They also examine the root of the Owls’ problems on offense, their injury-depleted offensive line, before delving into coach Charlie Partridge’s handling of quarterbacks Jason Driskel and Daniel Parr. After winning their season opener, the Owls will try to even their record at 2-2 when Ball St. visits Howard Schnellenberger Field for Saturday’s 6 p.m. kickoff. ESPN West Palm (106.3 FM) will carry the game live, with Ken LaVicka and Kris Bartels on the call. BOCA RATON – Kansas St., along with Miami the week prior, did a superb job of shutting down FAU’s offense. So did FAU, for that matter. After scoring 38 points in a season-opening victory over Southern Illinois, the Owls managed only 10 against then-No. 25 Miami and seven in Saturday’s blowout loss at Kansas St.
Quarterback Jason Driskel, who had previously done a fairly solid job of protecting the football, lost two fumbles on Saturday and threw two interceptions. FAU also committed untimely penalties, dropped passes and allowed constant quarterback pressure in a game where pretty much anything that could go wrong against the Wildcats did. While the Owls spent much of the week trying to correct the physical errors they’ve also been trying to keep their minds in the right place. Trickett is hopeful he’ll get injured starting offensive linemen Kelly Parfitt and Roman Fernandez back for Saturday’s game against Ball St., and all indications are that reserve offensive lineman Matt Weiner, who moved into the starting lineup for the season-opener when Antonyo Woods was injured, will return. While the Owls are searching for stability along the offensive line, they are desperate for production from their skill players – particularly the wide receivers. Aside from Kalib Woods, FAU’s wide receivers have been rendered silent. Woods has 19 catches on the season. Henry Bussey (8), Kamrin Solomon (5), John Mitchell (3), Pico Harrison (3) and Tony Thomas have combined for 22. Harrison is the only wide receiver to catch a touchdown pass – and that was a complete fluke of a play on a ball that caromed off Kalib Woods. (On at least one occasion, against Southern Illinois, Woods was wide open for a score but Driskel missed him badly). The Owls are still going to give Bussey a chance to make plays, especially in space, and Terry has at times been open down field, but Partridge made a point of noting the starting spot at the wide receiver spot opposite Woods is in play. BOCA RATON – It’s not the Owls’ tackling – or lack thereof – that’s giving defensive coordinator Roc Bellantoni fits, it’s the actual fits themselves. 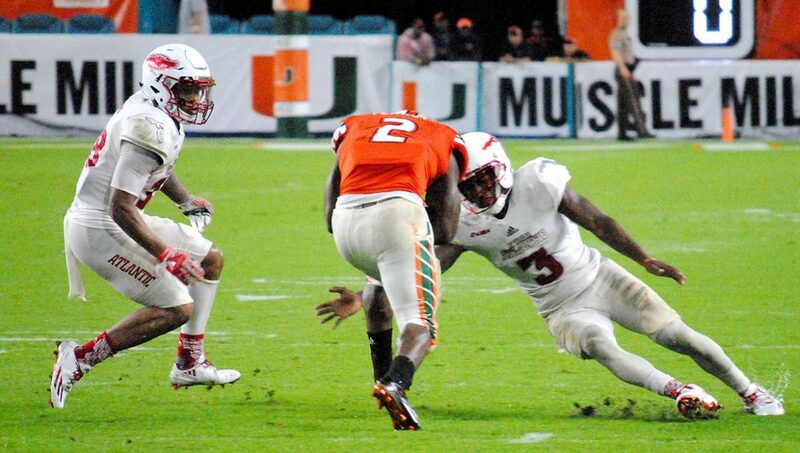 Essentially, FAU’s defensive woes can be attributed to its players being in the wrong place at the wrong time. FAU allowed at least 30 points in each of the first three games and currently ranks No. 117 out of 128 FBS schools in total defense, allowing 498.3 yards per game. In the opener against Southern Illinois FAU coaches attributed the poor tackling throughout the first half to over-exuberance that caused the Owls to abandon their tackling fundamentals. The Owls surrendered 38 points to Miami and 63 to Kansas St. in the two games that followed. In those instances, Bellantoni said, players disregarded their role in the overall defensive scheme in an attempt to make game-changing plays. “It’s like trying, in baseball, to hit a five-run homer when you are down by six or something,” Bellantoni said. “I think they need to just relax and play every play – let the game happen – instead of trying to get the sideline going by making a big hit, or going to get the ball when they should just be in the ‘B’ gap,” Bellantoni said. Frequently the problem starts along the defensive line and works its way all the way back to the secondary. Battling indecision while simultaneously being out of position can lead to big holes and missed tackles, but not as many of the latter as some might think. Bellantoni stands by a frequent assertion made most recently following the Southern Illinois game that the Owls are a good tackling team. He also takes issue with the statistic reportedly released by the University of Miami following that game that Miami running backs forced nearly 30 missed tackles by FAU defenders. Such a statistic, Bellantoni notes, is subjective – adding that FAU’s count didn’t show that many missed tackles. Bellantoni believes the Owls also tackled well against Kansas St., but he didn’t have the missed tackle count readily available. Against the Cardinals Bellantoni is urging his players to simply focus on their jobs. “We just need to get back to the basics of fitting and relaxing and being in the right spot and then making our plays,” Bellantoni said.